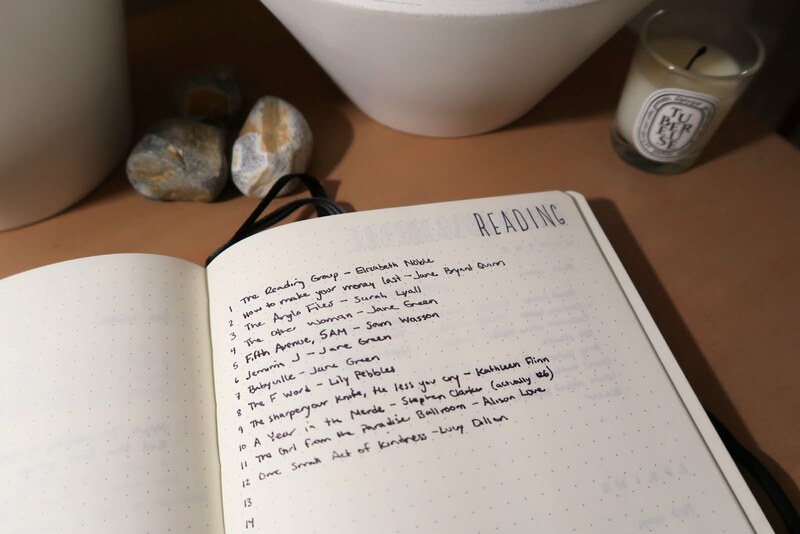 Once upon a time, I wrote exclusively about my Bullet Journal on this blog. (No idea what a Bullet Journal is? Read this first.) 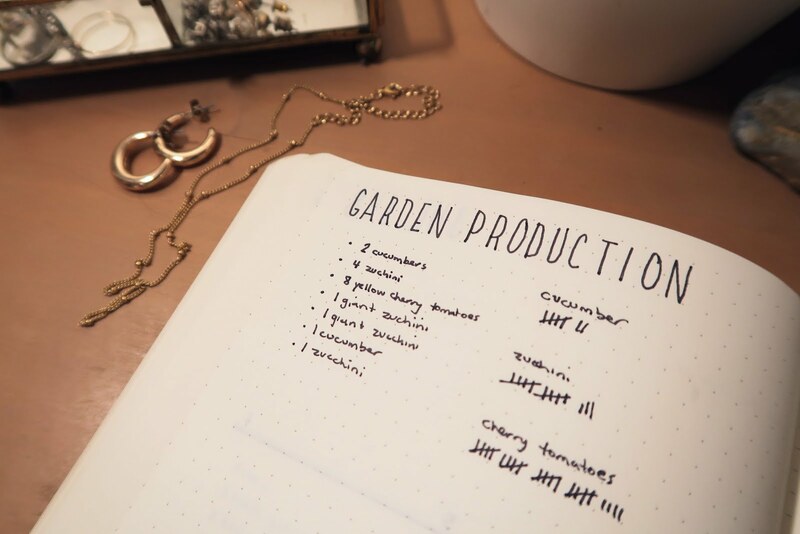 It was right when I first started Bullet Journaling and I was using it as not only an organizational tool, but also a creative outlet. I had found a safe place to play. A blank slate within the garden walls of structure. My first few notebooks were really colorful places, filled with lots of experimentation and even more washi tape. That style was perfect for me at that time but as the months rolled on I started feeling more pressure to keep it up (which I wrote about it some here). When I started a new notebook in 2017, I took a completely different approach. I went minimal. And it's stuck! A year and a half later, I'm still rocking the exact same notebook, pen, ruler, and basic layouts. Since it's been quite awhile since I've shared some Bullet Journal goodness, let's do that today! First off, my weekly. I ditched dailies almost right away in favor of a single weekly spread. I found the month view to be too broad of a picture when I just wanted to know what I was up to next Thursday or jot down a task for tomorrow. Nowadays I have a super simple weekly layout. Four lines per page, two pages for each week. I use the extra area for general notes and tasks for the week that aren't assigned to specific days. I always write the dates of the week on the top of each page, using the same style and in the same place. This layout has drastically simplified my weekly setup and it's super functional to boot. My monthly pages are equally as simple. 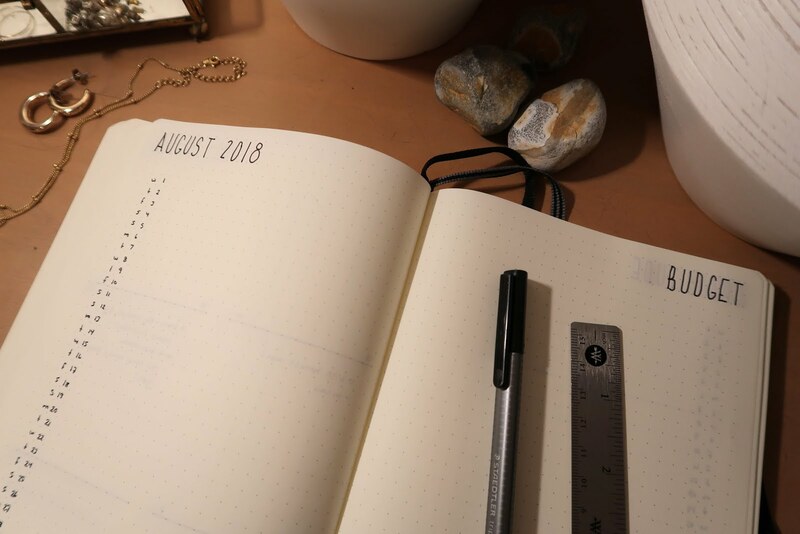 Each month I include a monthly overview page with one line for each day, a page for budgeting out each paycheck, a gratitude log with a single line for each day and a page to write a few goals for the month. 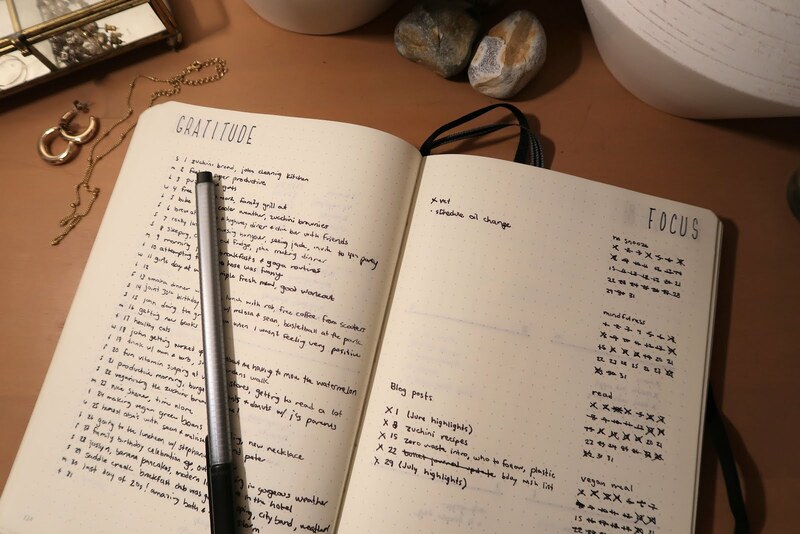 The focus/goals page is pretty flexible, but I usually write out what I want to post here each week and sometimes I'll include a few habit trackers. 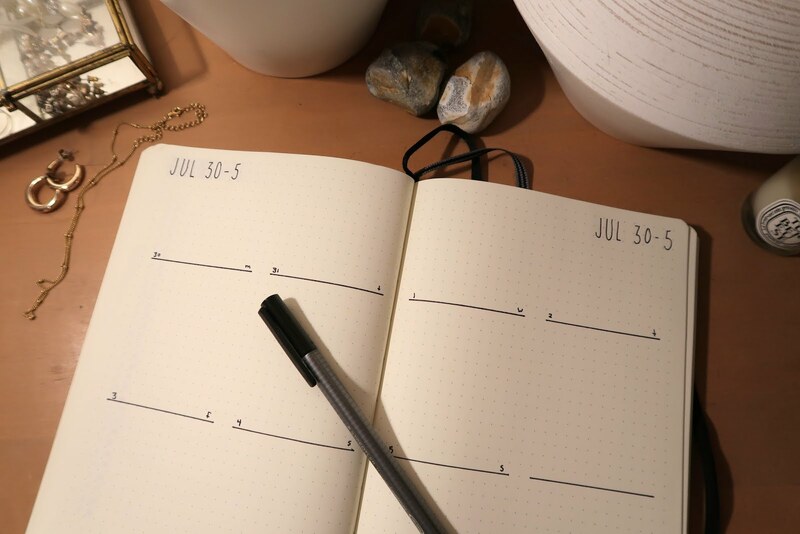 This month my focus is on relaxation and self care after a really busy July and I don't even think I'll include any trackers and that's totally fine! You can see what my small habit trackers look like on last month's pages. Super minimal and really easy to fill out -- just a "--" for completed or an "X" not completed. My annual setup has been pretty much the same since I started Bullet Journaling however. I always draw a little calendar, the month name and then leave space for birthdays and anniversaries before any tasks or events. It's been working really well so there's no need to switch it up! I also include a few of the same pages each year like a reading log, some wardrobe planning/review notes and some financial goal pages. 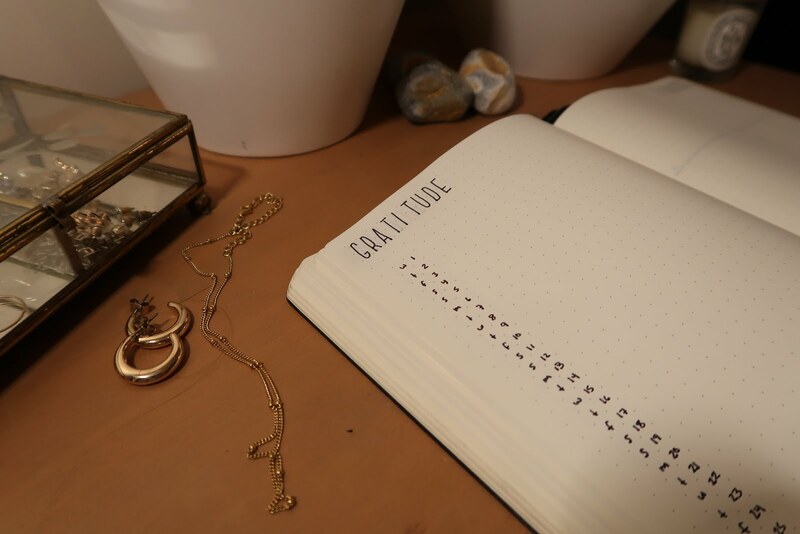 This year I have been trying to focus on only creating pages when I need them, so the number of pages I create a the front of my Bullet Journal each year has definitely shrunk. Next year I'll probably even cut out a few more, so it's definitely a fluctuating and adaptable process. Collections in my old Bullet Journals tended to be really elaborate and decorated. There was a lot of time spent planning the layout, and then I'd often times just never get around to it because I didn't have any new layout ideas. But what's a Bullet Journal if it's not useful? I gave up on all the layouts and now I just use the exact layout for each collection -- the collection name written at the top of the page in the same style I write every page header. Simple as. And just because you're so great for making it all the way down here, I'll leave you with my favorite Bullet Journal hack so far. 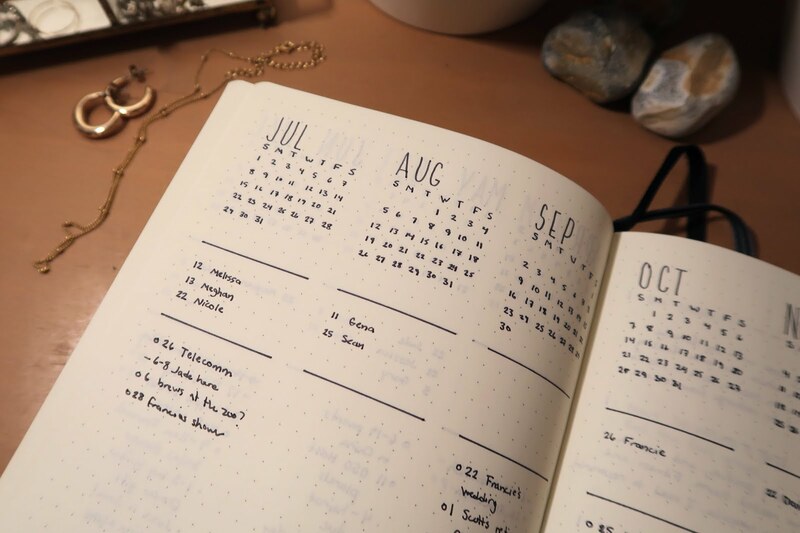 If you're worried about running out of pages, or ending up with too many extra pages after the year is up, take a few minutes at the beginning of the year to divide up your notebook by month. 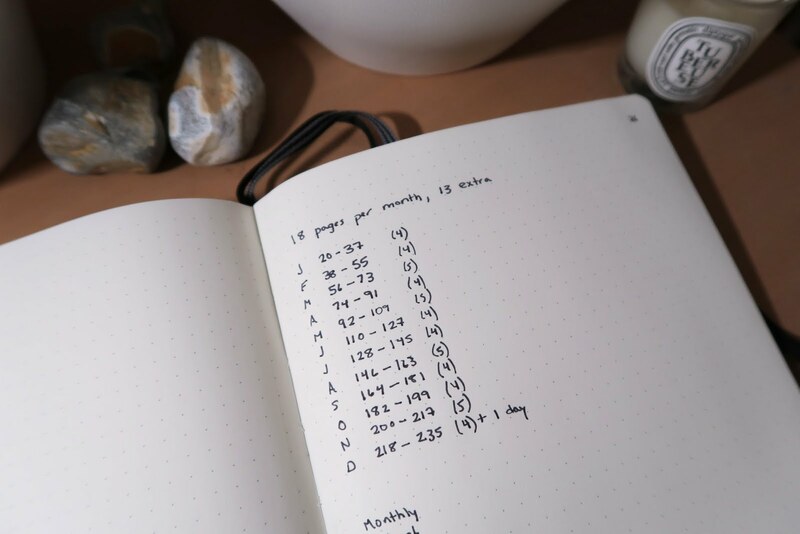 I write the page numbers that each month can comfortably take up in the back of my notebook so I always have it handy. It eases my mind when I have a ton of collections I'm adding and I want to make sure I won't run out of space later! That's a wrap on my Bullet Journal update. I've really found my grove with my notebook. I love how simple it looks and how stress-free it feels. I hope you guys enjoyed taking a peek! Let me know if you have any questions!